For enquiries: email: beth@kidsfabrics.co.uk or Tel: 07459 149120 For 'MADE TO MEASURE SERVICE' Please Click here. Swatches: Maximum 10 swatches sold in one order. A 'Credit voucher' will be automatically issued to the value of the swatches 'only', refundable on purchases over £25.00. Please note: A maximum of £5.00 will be refunded on swatches purchase. 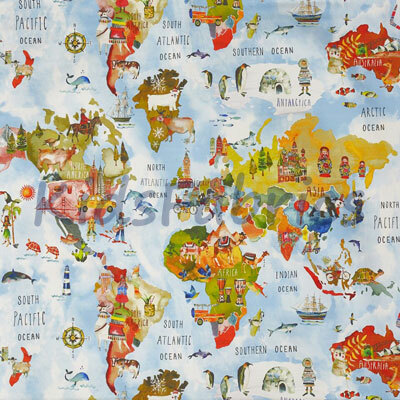 About Us Kidsfabrics is a global business providing a personal service. We are committed to providing the customer with a quality product, at a competitive price, delivered within the shortest possible time. We welcome customer feedback and any suggestions, which can help us improve our customer service. Making A Purchase Just browse through our online fabric shop and click on any items that you wish to buy and put them into the shopping cart. After you have finished your selection, click on "View Basket" and you will be asked to provide a few details that are required to complete the order. We accept cheques and credit cards. If you are shopping from overseas, place your order and your credit card company will convert the transaction into your currency. We accept Visa and Mastercard debit and credit cards, paypal, American Express and BACS [UK only]. Made to Measure Orders: You may pay by debit/credit card, PayPal or BACS [UK orders]. Do not send your credit card details via email as this is not secure. If you are shopping from overseas, place your order and your debit/credit card company or Paypal will convert the transaction into your currency. We accept Visa, Switch/Maestro and Mastercard. You may give your credit card details through the online shop or by phone. Do not send your credit card details via email as this is not secure. You may also choose to post your order details and pay by cheque to 'kidsfabrics'. Your fabric will be posted as soon as possible within receipt of payment, and you will be notified if the fabric is not in stock or if there is a delay. Prices may vary and subject to change without notice. Delivery Schedule Fabrics are normally dispatched within 7 working days of receipt of order, subject to availability. Customers will be notified in advance of any potential delays. Tax Charges Countries outside the EU may be subject to import duties.The customer should check whether these duties apply to any order they wish to place with kidsfabrics. We guarantee a full replacement of any fabrics damaged in delivery, subject to the return of the goods. Customers bear the postage costs of returning orders, unless the fabric is damaged or flawed. We will replace any fabric displaying a manufacturing fault, if returned within 14 days of customer receipt. Although the fabric is checked before dispatch, the customer is responsible for ensuring that there are no manufacturing flaws before cutting, laundering or making-up the fabric. No refund can be given on manufacturing flaws found after the fabric has been cut or made-up or laundered by the customer, or a third party. A re-stocking fee of 20% will be applied if the fabric order is CANCELLED after the fabric/item has been cut or ordered from our supplier. Although we endeavour to ensure that the colours on our website are as accurate as possible actual colours may vary, in addition the subtle colour differences may not be fully appreciated on some systems due to differences in the quality of the computer monitors/mobile phones/tablets etc.. We provide a fabric SWATCH SERVICE to ensure that the customer is satisfied that the fabric is appropriate for their requirements in all respects, notably quality, colour, pattern, weight etc. It is therefore recommended that swatches are obtained prior to purchase. Fabric is cut from a roll and is prepared specifically for you, if you choose to RETURN your order you may do so at your cost, however all cut items will be subject to a 25% cutting charge.